Remember the promise of a tax cut primarily for the middle class? For many Americans that will be a lie, and retired seniors will be hit the hardest, despite the attempted sleight of hand numbers game that “gives” you about double the standard deduction, but doesn’t mention the loss of personal exemptions. Even worse, the so-called reform means that a couple that used to itemize deductions above $12,700 (under 65) and $15,200 (over 65) will now have to wait until the itemization exceeds $24,000. 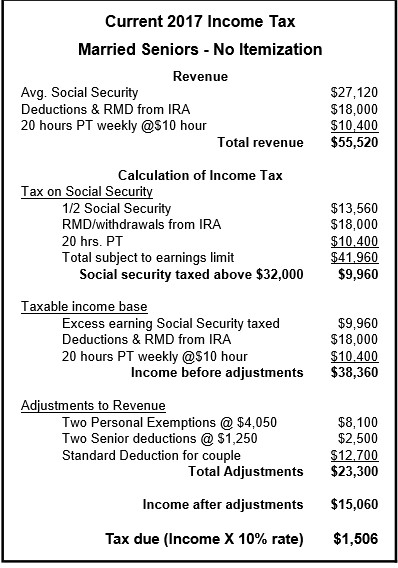 This average senior couple will pay $1,506 income tax under current law without itemization. Some might wonder about that tax on Social Security based on a couple earning more than $32,000, counting 1/2 of Social Security. This provision was passed at that rate in 1983 and the ceiling has never been increased, which now results in seniors paying $40 billion a year taxes on their Social Security benefits. 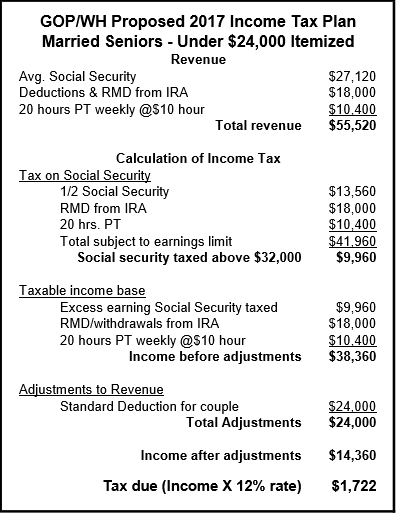 The next table shows the result of that same couple today itemizing $23,000 in deductions. With medical expenses that under Medicare can easily exceed $17,000 a couple annually, real estate taxes of, for example, $3,000 and mortgage interest of perhaps $3,000, plus charity, many seniors itemize now, but can’t under the new plan. By itemizing, this couple’s income tax will drop to $726 under current law. Now – the bad news! While many middle class families will see their taxes jump under the new tax plan, few realize how much this film-flam will actually cost them. 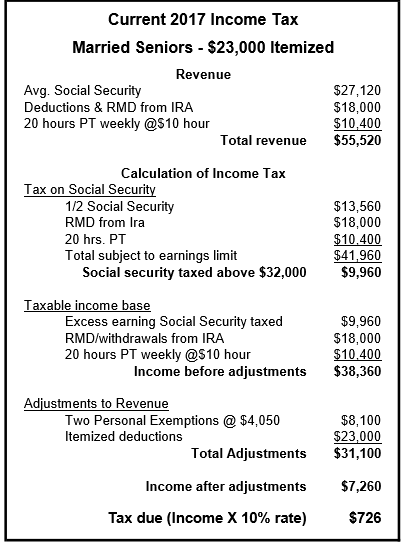 The table below shows the same couple with the same number of deductions, but now they must take the standard deduction, because their itemization doesn’t exceed $24,000. The result? A whopping tax bill of $1,722. More than if they didn’t itemize ($1,506) and 296% of the amount if they itemized ($726). Notice the new 12% rate, up from 10%. The media – including mainstream or FOX or OAN – have totally ignored this tax hike, concentrating instead on issues like whether the rich folks on the coasts will not be able to deduct their high state taxes. The good news for the friends of politicians is that their taxes will go down. Jeff Bezos’ family will save about $30 billion, when he no longer qualifies for Prime membership. And the same could be said of the Walton family members, who won’t pay $50 billion in Inheritance Tax. Speaking of the so-called “death tax”, remember that it only applies to couples with estates of more than $11 million. The rest of us are exempt. At average wages it would take about 300 years to save that $11 million and you would have to spend nothing during all three centuries. Raising taxes on the average family will not only allow the politicians to eliminate the Inheritance Tax, it will also cut corporate taxes nearly in half to 20%, end the Alternative Minimum Tax that cost President Donald Trump $31 million in just one year, and reduce so-called small business tax to 15% from up to 39.6% currently. This tax hike (for most of us) will also allow the defense contractors to make a few bucks, like Chamber of Commerce member Lockheed-Martin’s F-35 fighter jet program – now an estimated $406.5 billion. Congress has also decided that just raising taxes on the little people will not fully fund tax cuts for the elite. The new tax “reform” also includes $1000 billion (one trillion) in cuts to Medicaid – mostly from nursing home care for Americans who can’t afford $85,000 a year average. We have no cuts in Social Security in this current budget. Don’t expect an immediate public uprising because of these tax increases. What takes effect next year won’t be noticed in the November, 2018 mid-term elections, since tax time is April, 2019 – the next year. By that time, it will be too late, once again, to vote out the rotten rascals.